Three generations of the Elbaum Family participated at a beautiful and "haimish" Dedication Ceremony held in the Main Sanctuary of Congregation Sons of Israel, in Wayside, N.J. The Torah Ark - built in Kibbutz Lavi, Israel, is the focal point of the Synagogue, and houses the Torah Scrolls. The Ceremony was held on Sunday, August 15th, and services were conducted by renowned Chazzan Shimmy Miller, and Rabbi Yosef Carlebach. Over 100 Shul Members and guests attended this festive ceremony, and all enjoyed a lavish Sunday Brunch following the Rosh Chodesh Service. 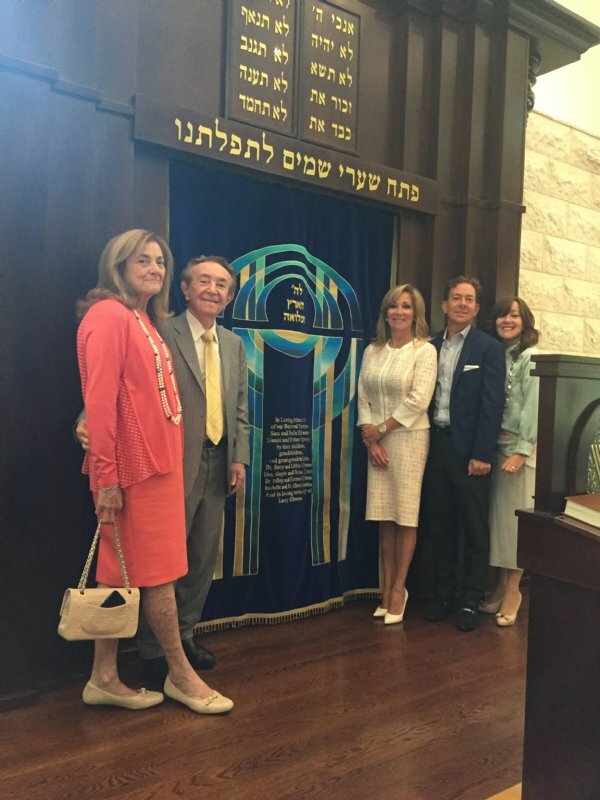 Pictured in front of the newly dedicated Torah Ark are Libbie Elbaum, Dr. Barry Elbaum. Dr. Gayle Krost, Dr. Jeffrey Elbaum, and Rochelle Matalon. The Elbaum Family dedicated the Holy Ark in loving memory of their Grandparents, Sam and Bella Elbaum, and Daniel and Esther Sprung, OBM.